Add the oil in a small non-stick saucepan on low heat and then add the flour and mix with a wooden spoon until combines well to make a paste. Add the garlic, pepper, salt and milk, and keep stirring until it combines well. Increase the heat slightly to low medium and continue stirring for another 3-5 minutes or until the sauce begins to thicken. Once thickens, remove from heat and add the spinach and combine until it defrosts or wilts. Add the feta, pesto and egg yolks and combine well. Beat the egg whites using an electric beater until they are firm peaks that stick to the bowl. Pour the spinach and cheese mix into a medium large bowl then fold the egg whites into the spinach and cheese mix in a figure eight motion to combine. Careful not to overdo it, you should still have chunks of foam through the mixture. Spray 4 x 8-10cm ramekins with olive oil spray and lightly dust them with flour (evenly distribute flour). Pour soufflé mix into each ramekin distributing evenly. 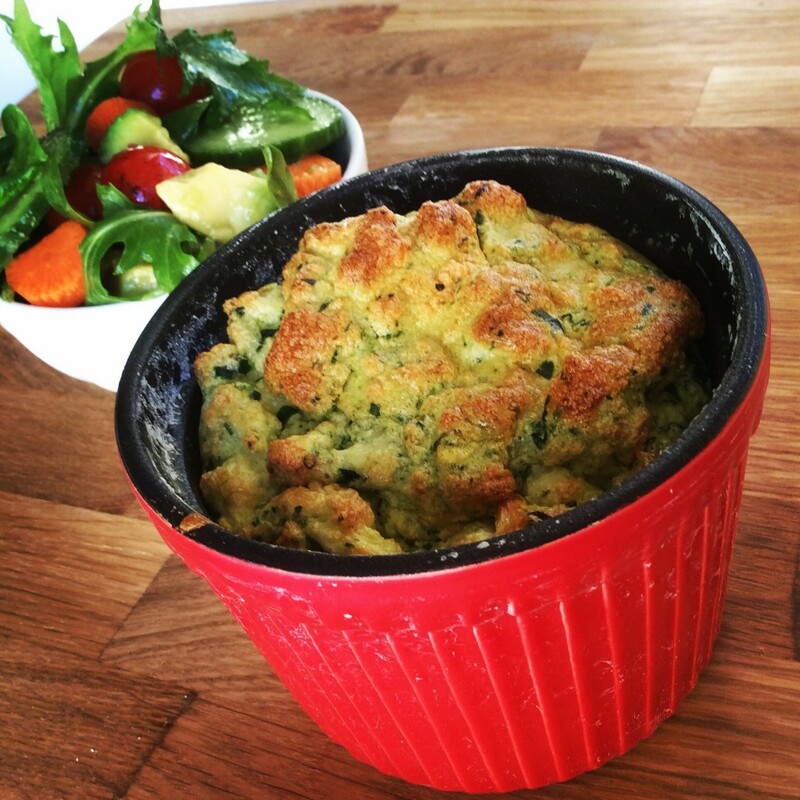 Place ramekin on a baking tray and place in the pre-heated oven for 25-30 minutes. Remove and serve immediately with a side salad or vegetables. You can make a big batch and store additional soufflés in the fridge for the next 2 days or so. The soufflés will deflate very quickly but they still taste the same. While this recipe is vegetarian, you can add finely diced lean ham or shredded chicken to it. But adding too much will make the soufflé heavy and it make not rise as well. me when new comments are added- checkbox and from now on each time a comment is added I receive 4 emails with the same comment. Its not my first time to visit this web page, i am visiting this site dailly and obtain good information from here every day. It’s an remarkable piece of writing for all the web viewers; they will obtain benefit from it I am sure. Whoa loads of great facts. Seriously all kinds of great facts! Incredible quite a lot of awesome info. The information mentioned inside the write-up are some of the very best offered. Fantastic material. Thanks a lot! Although web sites we backlink to below are considerably not connected to ours, we feel they may be in fact worth a go as a result of, so possess a look. Very good facts, With thanks!